I find that having such a huge backlog, makes it very hard to properly deal with closures. 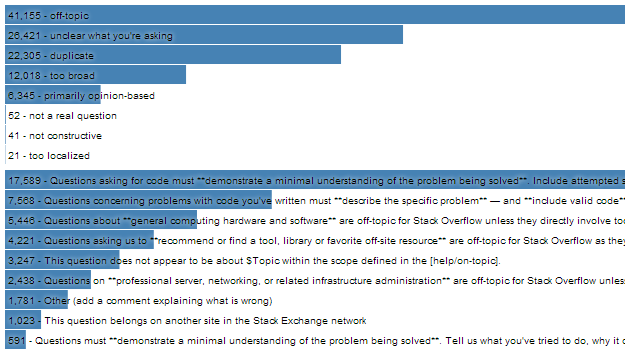 What steps or system changes can we make to get the huge close backlog on Stack Overflow, under control? 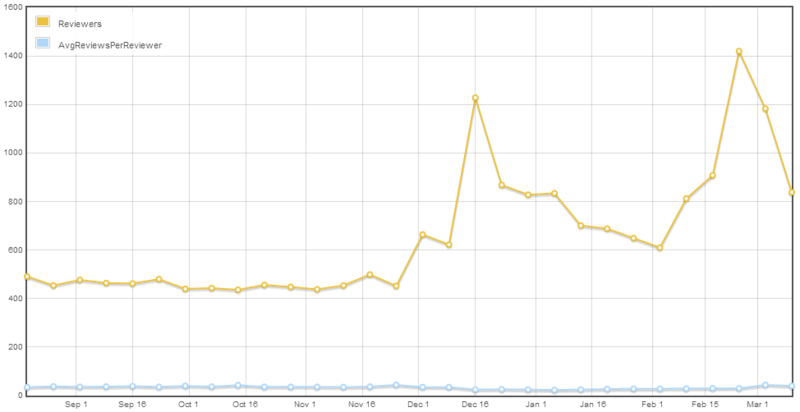 The additional visibility granted to this backlog by the review system has sparked a lot of discussion here recently. The problem with most of these discussions is that they don't agree on what the problem to be solved is... Other than that it must somehow involve the existence of a backlog. When you vote to close a question, if you've correctly identified a serious problem with the question and the problem isn't corrected, the question should be closed. And if you haven't, your vote should go away. If you don't agree with that, you should probably stop reading here... But I'm hoping this is something we can agree on; that even if /review didn't exist, this would still be a good baseline expectation for close-voting. We've built up an awful lot of behavior that depends on this assumed goal. Problematic questions should be closed quickly - if it's a real problem, letting it hang around stinking up the place isn't doing anyone any favors, and even conscientious users are less likely to put time into correcting them long after they've been posted. Questions that aren't causing problems shouldn't have close votes hanging off of them, like some terrible blade threatening to drop at any time. People are voting to close questions, and their votes are hanging around for months - even years - but the questions aren't getting closed. Some lousy questions are hanging around for long periods of time, clogging up search results and with little or no feedback given to the asker. Some questions are being closed years after being asked, and often after attracting perfectly good answers whose very existence casts doubt on the need for closure. Again, if you agree with the goal you should agree with this statement of the problem; if you don't, then you should've stopped reading already. Stop wasting time you could be using to tell me how wrong I am! And again, this isn't specific to /review - it's been a problem ever since we instituted the 100-view requirement for close-vote aging, at which point it largely supplanted the previous problem: close votes expiring before anyone else who could close had seen them. You see the problem, right? No, it's not the 57K backlog we started with; there are only 11K or so of those left. It's that we've only been "in the black" for 5 months out of the last 16. When most days - most months - end with a deficit, you never pay down the debt you started with... And eventually, folks get discouraged. Most of the questions in the queue actually need to be closed. A handful of people working REALLY HARD could close them all in no time, if we just gave them more privileges / required fewer close votes / skipped the whole "review" thing and just closed them all automatically / etc. #1 I'm just not seeing. Oh, for sure there's a lot of crap in there... But there's also a lot of stuff that's just in the queue because someone didn't know what the hell they were looking at and decided to flag it, or thought "minimal understanding" meant "already solved the problem and is just posting here for typing practice". Especially once you get outside the PHP tag. #2 is true in theory, but... We've kinda been trying to move away from that - the big hope for review was that it would empower folks enough that we wouldn't need 15 moderators closing stuff all day long to keep up. And the truth is, it's a lot harder to review stuff when you don't know jack about the topic. I'm pretty comfortable in winapi, but pretty much everything in heroku makes me suspect the author was drinking heavily when he wrote it; trying to distinguish bad from just weird is taxing... And, I'm fairly certain, less accurate. I'm going to try and use this thread as sort of a scratch-pad for tracking changes as we propose, discuss and implement them, as a way of staying focused. If you disagree with the goal (or the problem) statements above, please discuss them in answers here, but save discussion on the proposed solutions for their own threads. Allow direct linking to a filtered /review queue has enabled folks to jump directly into their tag of choice when reviewing. https://meta.stackexchange.com/questions/199879/fuzzy-the-number-of-questions-in-the-close-review-queue-a-dopamine-for-the-shut/209774#209774 has reduced the visible backlog, helping to focus efforts on questions most likely to be closed or left open. It's not all roses though; the average time between the first vote and completion of review for reviewed questions flagged in is 28 days - up from 12 days a month ago. We have to assume the bulk of this is due to the work being done tearing down the backlog, but we'll want to keep an eye on this to make sure we're not dramatically delaying closures (and thus depriving askers of timely guidance) long-term. Make it more obvious that the queue can be broken down by interest, highlighting areas mostly likely to benefit from the reviewer's attention. We've seen the effect that bite-sized pieces can have: when the progress you're making is visible, it's much more gratifying to keep making progress. Let's give folks the ability to observe their progress through a specific area of the queue. 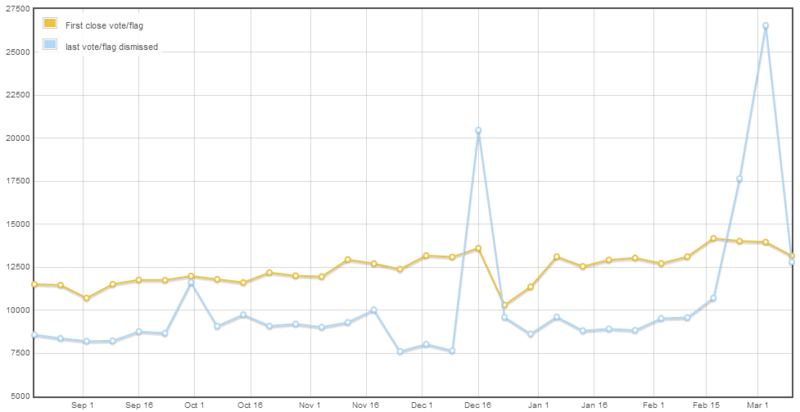 I think having more data about reviewers would help to better understand what goes on. 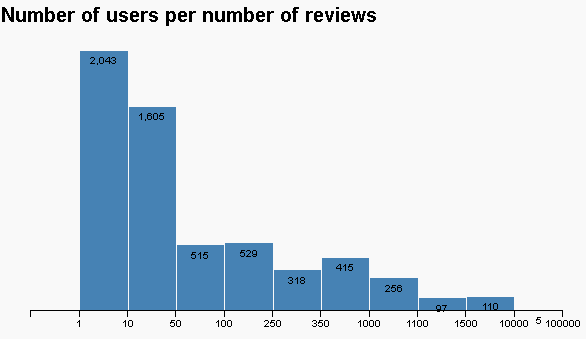 Specifically, it would be useful to see sort of "histogram" showing how many reviewers performed certain amount of reviews, like 2000 did 1 or more, 1000 did 10 or more, 100 did 100 or more reviews etc. 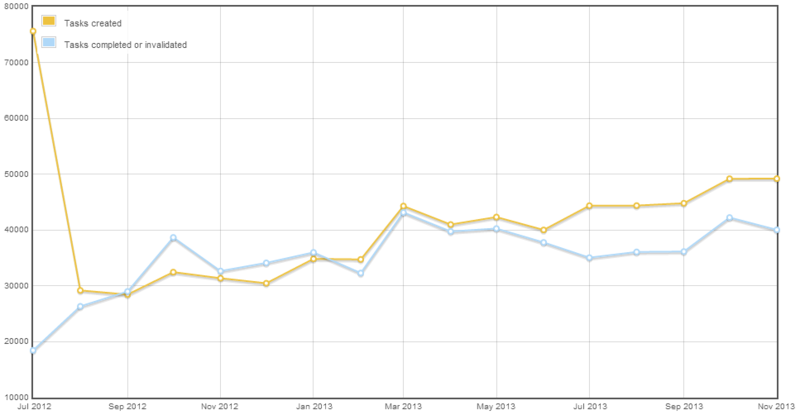 Sharp drop at 10-50 likely indicates that many users find it difficult to work in review queue. Drop after 250 (silver badge) suggests that even after substantial amount of reviews, many users still fail to discover a way to work productively (filtering 1, 2, 3). About half of ~500 users who have gotten golden badge at 1000 reviews indicated an interest to continue using queue even without badges. [...] closing must be fast - and much as I hate to admit it, that ship may have sailed. Still, when it works it's pretty useful - so worth looking for a solution, even if it only helps a fraction of the questions. That's what I see on SO, closure works well when it happens fast. But the mechanisms to deal with questions not closed fast – vote aging, and the review queue itself – don't work well enough. Aging is sort of invisible, but the queue is the opposite of that, it stands there in the top of the /review page, as if it were the most important thing reviewers should be working on. In my opinion, it isn't – because it's not manageable, and I'm not sure if it will ever be. I've been thinking, if fast closure works well, why don't we focus on that? Make all close votes expire after a certain time, regardless of the number of views. If a question gets closed fast, great. If it's not, it's removed from the queue after some time. If later it's noticed again and someone votes to close, it comes back to the queue, so it gets another chance of being closed fast. Unlimited chances could be allowed. This implicitly admits that we'll always have a certain volume of crap hanging around, but don't we currently have that anyway? For the most part, I agree with shog9's problem statement. I don't know the statistics on this, but perhaps one small way to help would be to add notifications for when a question you've voted to close is edited. That way you have a more convenient opportunity to go back and retract your vote. This would only apply to questions that are in the review queue, not to questions that have already been closed. The thought here is that I feel a lot of people, myself included, tend to vote to close questions shortly after they are posted -- e.g. when looking for new unanswered questions. However, questions tend to be very active during that period right after they are posted, meaning other users will probably leave comments like "What are you asking?" or "Please include X" which prompt the poster to clean up the question. The idea is that since questions frequently get close votes when they are new, but since there's a high chance of the question being improved during this same time period, a notification would draw your attention back to the question and give you a chance to retract that vote. One potential problem: This is also the time period when "minor" edits such as code formatting and tag/title cleanup are occurring. Since those edits would produce notifications too, users may tend to get irritated at receiving them and learn to ignore them or come here to complain about them. However, I think a solution for that is that the notifications should only be sent if the edit is made by the original author, and if the edit makes a sufficiently large change (in terms of number of characters edited). I don't think it's a problem that you can't vote to close again after your vote has been retracted. I can't conceive of a situation where you would vote to close a question, then retract it because an edit was made to make the question valid, then for whatever reason decide the question should be closed again. So I don't see that as a downside. This wouldn't help clear existing items out of the queue, but I think it will increase the chances of new items not sticking around, and so help slow new queue growth a bit. Not sure how much this would help. I feel that I would find it useful -- but again I don't have any statistical information on just how many bad questions are actually improved to be valid early on. It might be worth implementing this as an experiment, if anything, to see how much of an impact it would have and gather some more data points. Tag-oriented analysis would be terribly incomplete (up to the point of total failure) without a corresponding data breakdown by closure reasons. Particular tag may be technically complicated / obscure, or it may have a lot of questions in queue, but without knowing breakdown by close reasons, it doesn't make sense to believe that it makes a trouble in a CV queue. Say, if 99% queued questions in this tag are resource-requests, it would be only a matter of getting more reviewers / reviews to clean it up, straight and simple. how many users have at least once tried the queue? how many users have demonstrated a strong interest, by performing substantial amount of reviews? how many users have proven ability to perform a lot of reviews? Three latter data points can be roughly estimated by amount of users having respective Custodian, Reviewer, Steward badges in the queue. Quite a pity that badges pages are useless in helping to find this out because of indiscriminately counting badge holders in all queues. Side note - as far as I can tell, tag-oriented analysis currently looks for the long tail in the wrong place. An example of what I would qualify as true long tail, would be not questions in particular tags (indiscriminately aggregated, no matter what's the close reason), but duplicates. Per my experience, duplicates are tough and take much effort, even in the tags I am well familiar with. Maybe there are other "difficult" close reasons besides duplicates - I can imagine minimal understanding, or too broad, or unclear being tricky, especially in tags I'm not familiar with. When you have a "system" like SO with lots of circular feedback mechanisms, I think it's hard to agree on a single "end goal". That said, I very much agree with the focus of Shog9's post, which I look at as timely and appropriate resolution of the per-item close process, one way or another. While I have opinions like everyone else as to what structural changes ought to be introduced to get us to the point where we are reliably handling the incoming flow, let me just say that I think other Lean principles apply, as summarized in http://www.craiglarman.com/wiki/downloads/scaling_lean/toyota-house-larman-vodde.pdf. For example, "Simple visual management" would seem to be particularly critical in getting our arms around this problem. Shog9 and others have done good work in creating charts that helps us understand the situation better. Others have submitted good ideas for making visible to users the current state of the input queue that they are interested in tackling. Another potentially helpful Lean principle to leverage, I think, would be use of teams and tag-oriented teams in particular. Not only is the close process more efficient and effective when participants are technically knowledgable, but there already is a sense of "ownership" for various tags within the community. We should leverage that. 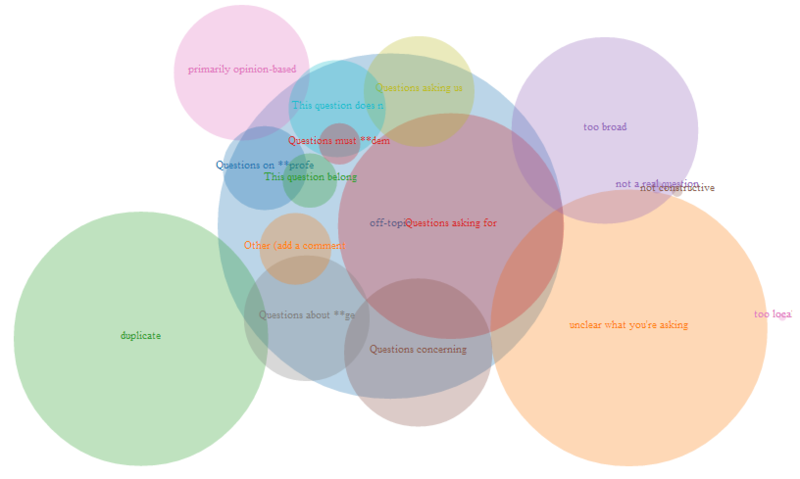 One final note is that I think it's important to remember that the actual incoming flow of questions-that-people-want-to-close may actually be much higher than the flow of questions into the close-vote review queue, since many people are undoubtedly not voting-to-close in the current situation. That's yet another reason to address the steady state first. If more users can review CVs, then more reviews can be completed in the same timeframe. Some close vote reviews are simpler than others, particularly the "recommendation" and "no repro code" off-topic reasons. Users with a lower reputation threshold should be able to evaluate "recommendation" and "no repro code" CVs. 500 rep allows a user to review first posts and late answers, so these users could help with the some CV options. Of course, these CV reasons will be subject to audits just like any other part of the review queue. The purpose here is to DECREASE the portion of the close review queue, that is due to low-quality questions, by making common requirements clearer. 1) The goal:  what is to be accomplished. 2) Platform, development language/environment/tools, operating system, all w/ versions. 3) Initial work -- tried so far. 7) Resolution work -- tried so far. 8) Questions -- anything you'd like more information on -- details, principle or practice. 9) Ideas -- where you think it might need to go next. Some boxes might be required, but in any case make it clear to the user that better use of the boxes speeds up the process of helping them... and more empty boxes can lead to a question being put on hold. THEN, this will also help speed up the review of the close queue -- it will be quicker/easier to IDENTIFY gaps/issues, to EXPLAIN the reason for the close, and at review time, to DISCERN if it's a valid close. Consider possibly taking questions on hold as low-quality questions OUT of the queue of visible questions.... and when certain boxes (or enough boxes) are not filled in, possibly AUTOMATING the close review. If the template idea seems too restrictive, they might select "Freeform text or Template" with a radio button... but again, communicating to them that the template can make help more likely, and faster. P.S./edit: A freeform text box would probably still be helpful, after the template boxes. Also, it might even help to have "edited" notifications -- who and when -- as now, next to each template box. A user can more quickly complete CV review tasks by refining them to focus on one specific off-topic reason. I have suggested this before in relation to edits, and I think the idea, though it didn't seem to be well-received there, sounds good to me here too. The PHP tag, with the most questions in the review queue, has a "close vote posse" (I don't like the term myself). There's a script and a backlog page. And we're still buried. The "cv-ring", as we call it, is usually a pretty effective process, though it seems to make some people uncomfortable. I think it is effective; the people in the room know their stuff, so when ircmaxell, for example, posts a question that needs to be closed, I can be reasonably sure the question warrants closing. So I pop over to the question, read it over. 90% of the time, I agree with ircmaxell's assessment and vote to close. I might post a comment. If there are 3 other people online who are game, the process happens pretty quickly, and I view that as a success. We could skip this process if we gave users with experience in a given area more weight when they evaluate a question. And the great thing is, we already know who has experience in a given topic, because we have a fairly deep bank of statistics regarding their adeptness at answering questions in any given tag. Had ircmaxell, with a gold PHP badge and 9 Great Answers in the tag, been thus empowered, the chat room stage and the waiting for 4 other users and the PHP cv backlog are all unnecessary, as is the queue deficit. Ircmaxell can just take care of it. Or me, with a silver badge, and one other silver badge-holder. Or 3 bronze badge-holders, or 5 non-badged users. Something to that effect. We have evidence of, if not expertise, at least adeptness at answering questions in a given subject. People who have shown they can extract meaning from a question, and a willingness to try and provide an answer. They aren't here to close questions if they're answering, and answering well. Why not tap into that, and more importantly, trust it? Some of these, at least, are questions which are duplicates of other questions of similar or greater age, also with perfectly good answers. The answers to the question marked for closure say much the same thing. Should those questions be tagged for closure? If not, should I have stopped reading some time ago? I've no idea why so much a fuss about closures. And especially about the queue. bad question always gets an answer faster than you can close it. Means no harm neither for the OP nor rep-whunter. even closed, it still hangs around. worst part: only 1 out of 10 really bad questions manages to get a vote. This is a real problem. Out of good site you made just a game with scores and badges. It attracts gamers, not programmers. Most participants are after only rep and badges, not sharing knowledge. As long as this status quo persists, anything you do will fail. Your motivation system is rotten. Rep'n'badges do not encourage writing good answers for complex questions. Only desire to share a knowledge do. If one wants to share - they'd share without no badges. While reputation IS the thing that encourage writing fast answers for lame questions. As long as your only concern is rep points, you'd like as much lame questions as you can answer. And most silly questions you'd like most - for they take you no time to copy and paste from other answer or a manual page. And it creates so strong positive feedback-based circuit that it never even notice none of your silly struggle with closures. You have to incentivize review. I don't see a way around it, and I also don't see why not. You're rewarded to make high quality contributions. Shouldn't you be rewarded for keeping the low quality contribution out? Something symbolic like +3 on successful closure (i.e. 4 other people or a moderator agreed with you) should get people involved. I'm aware it isn't perfect, and that sometimes good questions are wrongly closed. But we're talking about mainstream here, not edge cases. (We can revoke the points if the question gets reopened for example). The tag filtering and close reason UI must become more obvious. I didn't know about the feature until someone told me about it. Duplicate question handling isn't easy right now. It's sometimes not clear which is a duplicate of which. Also, introducing system recognized canonical questions can help. I have only one quasi-quibble to offer. I don't see how to distinguish a legitimate close vote that languishes in the giant tide from an invalid one. If I vote to close a stinker, and my vote just hangs out there in the queue, is it because I was having a grumpy day, or because the inflow rate is such that the question is already lost in the sauce? In the 10k pages we used before the review queues, there was something of an immediate community feeling: I could visit and see what other people had nominated for close, and I could quickly join in when I agreed. Maybe one of these subdivision of work ideas will recreate that atmosphere. Maybe the flag business was a mistake. We now have a ton of people with enough rep to out and out vote. Perhaps allowing people below that rep level to suggest closures via flags is adding more noise than signal? One idea I have is this: by all means, time out close votes. Just time out the 'you already voted to close this question' with them. Most of the time this will be uninteresting, but every so often it will allow some of us a second attempt to clean up actual trash. Why are there so many pending close votes in Review? Closing questions just makes people feel really bad - can we make it harder in general? Are we losing the battle against the close vote queue? Can we have a “recommendation and off-site resource” filter for the Close Review Queue?